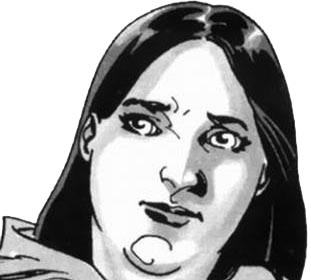 First Appearance: The Walking Dead #10 (July 2004): "Miles Behind Us, Part 4"
Lacey Greene is the oldest daughter of Hershel Greene, who is one of the most religious characters in The Walking Dead series. Less is known about Lacey, but she is probably less religious than her father, but the family faith is still an important part of her background. In the comic book series and TV series, Hershel's precise denominational affiliation is never revealed, but he is clearly Christian, and apparently Protestant. In the comic book series, Lacey met Rick Grimes and his associates when they arrived at the Greene farm. At her father's request, Lacey showed them around the farm. Lacey was bitten by zombies and killed soon after the Grimes group arrived. In the TV series, Lacey was bitten by zombies and became a zombie herself before Rick Grimes' band of survivors arrived at the Greene farm. Lacey was one of the friends and relatives of the Greene family who are kept in their barn. She was destroyed along with the other zombies in the barn when Grimes' associates opened the barn and killed the zombies in there. 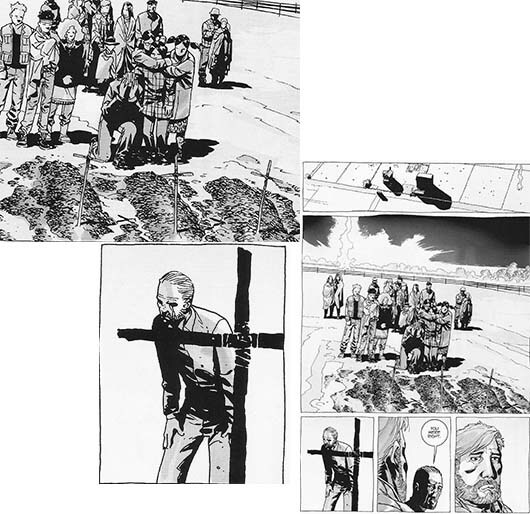 BELOW: Hershel Greene buries three of his children and marks their graves with crosses: When Hershel Greene tried to herd a wandering zombie into his barn, the zombies already in the barn (including his zombified son Shawn) escaped and attacked. Hershel's eldest son Arnold and his eldest daughter Lacey were both killed by the attacking zombies. Rick Grimes and his band of survivors help Hershel kill all of the zombies. Afterward, Hershel buries Arnold, Lacey and Shawn. He marks each grave with a simple wooden cross. The Walking Dead #10 (July 2004): "Miles Behind Us, Part 4"
The Walking Dead #11 (Aug. 2004): "Miles Behind Us, Part 5"